A Rustington couple who were children during World War Two recently celebrated their diamond wedding together. Frank and Margaret Pink, of Oakhurst Gardens, have lived in 12 different houses and been members of eight church congregations over their 60 years of marriage. The pair went to the same school, though four years apart, and Margaret, 83, was friends with Frank’s sister. They lived in Surrey as children during the war and they recall air raids happening every day. When her school was bombed, Margaret went to live with her aunt for six months or so. Frank, now 87, remembers seeing a plane on fire coming through the clouds and crashing just behind the school on a different occasion, before Margaret had joined. They married on January 24, 1959, at Woodmansterne Baptist Church. Frank was in the Merchant Navy and was usually away at sea for months at a time but was home for four months, so that was when they had the wedding. The couple have three children, Tina, Michael and Wendy, but also raised their nephew, Oliver. They now have eight grandchildren and four great-grandchildren. 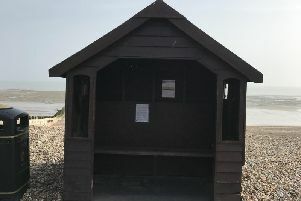 Before they were married, Margaret worked in offices in London but the pair have had various jobs over the years, including owning a mobile shop which went around Littlehampton and Angmering, which often kept Frank busy until 11pm. Margaret moved to Liverpool to be close to Frank, who was stationed there, but they have also lived in Fontwell and Bognor Regis. Frank loved to paint and his artwork is on display in the couple’s home. He has also written a lot of sea stories over the years, recounting his time in the Merchant Navy when he visited countries including Russia, Germany and Japan. He had plenty of adventures during this time, including swimming with sharks in India and learning Chinese from the workers on the ship. They moved to Shrewsbury to help out their daughter after they retired and stayed for nine years before deciding to move back to Sussex. Now living in Rustington, the pair said they do not think you could find a better place to live. When asked the secret to a long marriage, the couple said they never get bored.